Training naturally climbing vegetables up supports yields rich rewards. By lifting plants off the ground and up towards the sun you will enjoy bigger harvests from a relatively small patch of ground. Climbing vegetables are easy to pick, require less weeding and can be used to create a leafy backdrop or windbreak for your plot. As well as many off-the-shelf solutions such as arbours, arches and pergolas, there are plenty of homespun alternatives that will save you money. A trip to any home improvement store will supply you with all you need to inexpensively make your own supports in no time at all. Cloaked in lush foliage, your home-made supports will become a handsome and productive centrepiece to your garden. The very simplest supports include sturdy stakes, poles and trusty bamboo canes. Pushed securely into the ground at the base of plants they offer an immediate vertical hook for vining vegetables to grip hold of. At first you may need to tie in young growth to their supports to encourage them up in the right direction. Canes or poles can be arranged in traditional rows with a horizontal cane linking the tops to create a rigid structure. Tie in the canes where they cross with string, twine or wire. Alternatively, why not create an attractive wigwam or tepee? Space four to eight canes or poles at equal intervals around a circle marked out in the ground - a foot (30cm), from the top using string, strips of cloth or wire. 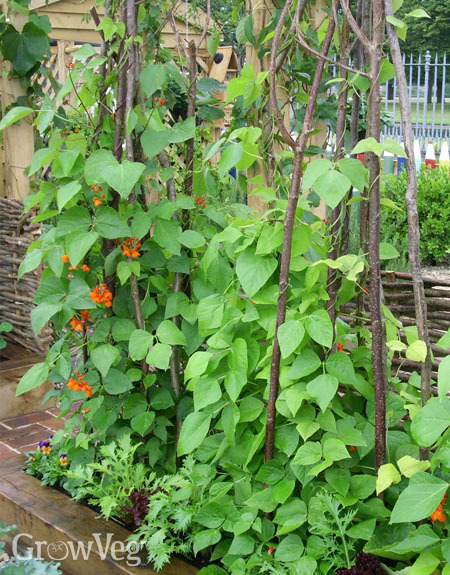 Bamboo and willow wigwams are perfect for climbing peas and pole beans, while taller, sturdier wigwams made of thicker poles are recommended for heavier climbers such as squashes and melons. Poles can also be arranged in a square layout. Wind round parallel rows of string between the poles if additional support is needed. Natural poles such as those made from hazel or willow give a lovely rustic look. 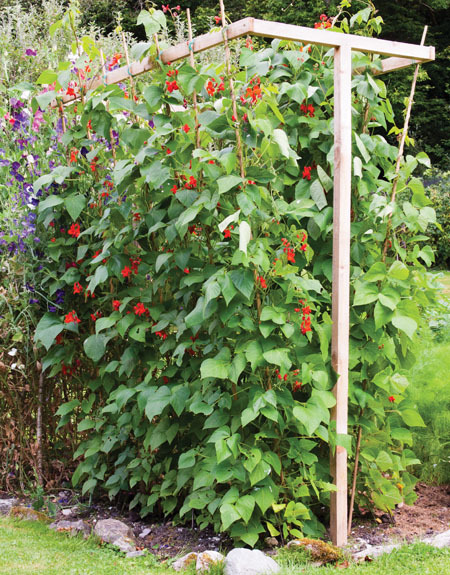 Trellises are an easy and flexible way to provide instant support for your vertically vining veg. Trellis panels can be screwed to walls and fences, or left free-standing by attaching to upright posts. Use them for growing beans, peas, squashes and more. For a contemporary look secure sheets of thick-gauge galvanized wire mesh between two frames made from wooden battens. Finish with a coat of paint. Make your own mini-trellis by securely tying lengths of cane together using wire or string - just the job for individual squash or marrow plants. Many of these supports can be included in your garden planning. Our online Garden Planner incorporates a selection of structures, from arches and arbours to willow wigwams. To drop one onto your plan simply click once to select, move the mouse to where you want to position it, then click and drag to place. The corner handles can be used to expand the structure to the correct area. Want to try making your own bean frame? We’ve discovered the ultimate solution, with bamboo canes positioned in such a way that the pods hang outwards, away from the frame, making them much easier to spot and pick. The stems are also less likely to grow into a thick, tangled mess. Start by sanding down any rough edges to the timber using the sandpaper. Now put together the top of the frame, screwing the 5ft (150cm) lengths of timber to the 32in (80cm) lengths. To prevent the wood from splitting, drill pilot holes one inch (25mm) in from both ends of the two 5ft (150cm) lengths of timber. Screw these to the ends of the 32in (80cm) lengths using the 2.5in (60mm) screws. The rectangular top of your frame is now ready to screw to the 7ft 4in (220cm) uprights. Measure and mark halfway along the two 32in (80cm) sides of the top section. Drill pilot holes through these two points. Screw the top section to the uprights using the two 4in (100mm) screws. Now it’s time to lift up and position the frame. First, dig two holes to accommodate the uprights. Bury the uprights into the ground, backfilling the holes and firming in with your boot to get a good, tight finish. A hole that’s at least one foot (30cm) deep will work best. You will find this part of the job a lot easier with an extra pair of helping hands. The frame’s now ready for the bamboo canes. Set the canes at equal distances along both sides of the frame. Push them into the ground to get an even finish along the top of the frame. Tie them in with wire, twine or string. Now plant your beans, one to each cane. It won’t take long for the stems to latch onto the canes and pull themselves up. In a few months you’ll be picking pods a-plenty! Climbing vegetables are a must for gardeners looking to pack more into their plot. Give them the support they need and they’ll thrive, giving you a vertical wall of veg. If you’ve got any ideas for home-made supports please do share them by dropping us a comment below. "This looks simple and awesome, definitely gonna give this a try!" "Great help for a first time gardener like me"
"do you use this frame year after year, do you dig out a trench each year to get around the rotation of crop problems as the frame once planted looks sturdy enough to reuse?" "Hi Milly. Yes, the frame is reused every year. It's just lifted up out of the ground. The top section is then unscrewed from the uprights and it's all stored away. Then the next spring it's screwed back on and pushed into place. We always recommend rotating your crops, so the beans would be grown in a different place each year. That said, my grandfather used to dig out a compost trench every year, as you suggest, and keep his beans in the same place, to no ill effect. But it's not very difficult to move the frame, so I'd be inclined to do that if you can." "Great idea. I have a 25Ft row of beans to plant. Can this be modified to create a longer support?" "Hi Don. Absolutely. You'd simply as many additional uprights and horizontal lengths of timber as necessary to make the full length of your row, adjusting the positioning of the horizontals to the uprights so they fit squarely on the uprights and are fully supported." "will this work for vining tomatoes too?" "I haven't tried it with vining tomatoes but I don't think the trellis demonstrated in the video would work, as I think the vine would be too heavy and would run the risk of slipping down the canes. Beans twine themselves round, so have much more 'grip'. But, nevertheless, it could certainly be worth a try, especially if you are happy to tie them in very regularly as they grow upwards." "Should this be 4 off 2.5in (60mm) screws 2 each end?" "Hi Colin. You're absolutely right - there should be four of the 2.5in (60mm) screws used to screw together the top section of the bean support - two screws for each end. We'll amend the text to correct. Well, spotted, and thank you for being so on the ball!" "Have you ever thought of growing runner beans horizontally ? Or supporting cordon tomatoes without canes or tying ? I do both. Anthony"
"Hi Anthony. Thanks for sharing. I'd love to know your method for growing cordon tomatoes without canes or tying." "Fine, Ben, What is best way to contact you ? Anthony"
"Hi Anthony. If you're able to post a short summary/description of your method here that would be fantastic. It would be great to share your technique if you're happy to do so. :-) "
"Hi Anthony. If you're able to post a short summary/description of your method here that would be fantastic. It would be great to share your technique if you're happy to do so. Many thanks. "